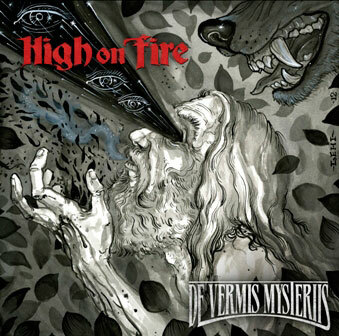 Oakland, California hard rock band HIGH ON FIRE will release its new studio album, “De Vermis Mysteriis”, on April 3 via eOne Music. Recorded in Salem, Massachusetts’ GodCity Studios with producer and CONVERGE guitarist Kurt Ballou, the 10-song effort — touted as “direct, eye-opening and powerfully supernatural” — is the band’s sixth studio recording and the follow-up to 2010’s “Snakes For The Divine” which debuted at No. 62 on The Billboard 200 chart and has been called “wonderful” by The New York Times and “an exhilarating rush” by the Chicago Tribune. “De Vermis Mysteriis” (or “Mysteries Of The Worm”) takes its title from a fictional grimoire created by “Psycho” author Robert Bloch and incorporated by H. P. Lovecraft into the lore of the “Cthulhu Mythos” (Lovecraft mentioned “De Vermis Mysteriis” as one of the books that “repeat the most hellish secrets learnt by early man”). The album carries a deeply mystical undercurrent, incorporating fantastical themes and lyrics detailing, among other things, time travel, a serum called liao that is made out of a black lotus and “a Jesus twin who can see the past through his ancestors’ eyes.” And that’s just scratching the surface! Musically, “De Vermis Mysteriis” is absolutely explosive, showcasing the California power trio’s thundering roar and expanded harmonic and rhythmic palettes while the songs move confidently through multiple riffs and movements. HIGH ON FIRE construct tough, burly stoner metal that is at once devastatingly epic and mercilessly metallic as superstar guitarist Matt Pike‘s sizzling ax and avenging-angel riffs fuse with Des Kensel‘s double-kick-drum onslaught and Jeff Matz‘s concrete crushing, Burton-esque bass guitar. Over the course of forty-five minutes, HIGH ON FIRE have created an amalgamation of fantastical lyrical ideas and brute force musicianship anchored in an endlessly captivating, punkishly frantic sound. Simply put, the band generates awesome on demand and has a virtual chokehold on monolithic-sounding, masterfully crafted epic music. HIGH ON FIRE is a savage bull in the china shop of modern metal. 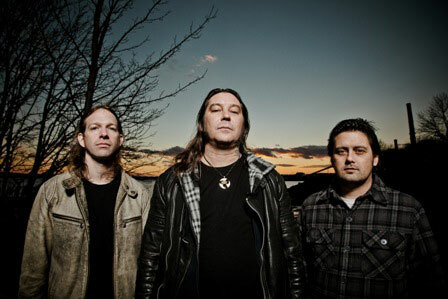 In advance of the new album’s release, HIGH ON FIRE will perform a number of live dates as part of the 2012 SXSW (South By Southwest) in Austin, Texas. The band is expected to preview new material at the shows.